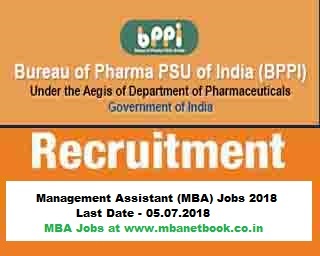 Recruitment of Management Assistant in BPPI - BPPI is the implementing agency for Pradhan Mantri Bhartiya Janaushadhi Pariyojana of Department of Pharmaceuticals, Ministry of Chemicals & Fertilizers, Government of India. Educational Qualification - MBA. Candidates having good presentation skills shall be given preference. Experience Requirement - Total 05 years’ experience in Secretarial work with Fluent English, Writing & Speaking Skills. Job Description - 1. Organising meetings, attending calls, making presentations 2. Time/Diary management 3. Correspondence and following up on pending matters with limited direction 4. Responding to urgent requests 5. Organising and preparing documents, preparation of meeting and board papers 6. Co-ordinating and booking travel arrangements 7. Any other task assigned by Management. How to apply - Interested candidates may send their applications to CEO, BPPI at BUREAU OF PHARMA PSUs OF INDIA (BPPI), E-1, 8th Floor, Videocon Tower, Jhandewalan Extn., New Delhi – 110055, through registered post/courier by 05.07.2018 (Till 05:00 PM).